During the last month, I had received an email from one of my blog readers, who is a retired Govt Teacher (residing in AP). Her story is a heart-touching one… Though she receives a monthly pension, it is not sufficient to meet her living expenses, as she is suffering from a Critical Illness, which requires medical treatment every month. She is now even unable to meet her day-to-day expenses. She has also informed that she gifted a rental income generating property to her daughter (when her daughter was in a deep financial trouble) around 6 years back. And unfortunately, no one is taking care of her now. Her main query to me is – Is it possible to take back my property from my daughter? Is this legally possible? 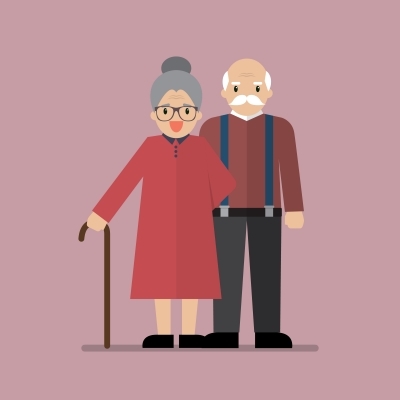 I have recollected a topic which I had first come across when I was pursuing my CFP (Certified Financial Planner) course..this topic is regarding, ‘Maintenance and Welfare of Parents and Senior Citizens Act’. I have informed her all the details which I know about this Act and she is now taking help of a civil lawyer and fighting for her rights. So, what is this Act all about? What are the legal provisions mentioned in this Act regarding maintenance support to elderly parents and senior citizens? MWPS Act has been passed by the Parliament of India and got the assent of the President of India during 2007. The main objective of this Act is to provide more effective legal provisions for the maintenance and welfare of parents & Senior Citizens. Parents (or) Senior citizens who is unable to maintain himself or herself is entitled to make an application under this Act to get monthly maintenance amount from his/her children. What is Maintenance & Welfare? – Maintenance is defined in the Act as including “provision for food, clothing, residence and medical attendance and treatment”. Who can claim Maintenance ? Parents : As per the Act a “parent” means father or mother whether biological, adoptive or step father or step mother, as the case may be. Parents may or may not be Senior Citizens. Grand Parents : Paternal or maternal grand parents can claim maintenance from their children or grand-children (male or female, who are not minors). Senior Citizens : A senior citizen who is an Indian citizen who is 60 years of age or older. In case if a senior citizen does not have children then he/she can claim maintenance from a relative who is either possessing his property or who will inherit the property after senior citizen’s death. However, such relative must not be a minor and must have sufficient means to provide maintenance. How much can be claimed under this Act? The main criteria for claiming maintenance under this Act is that the parents / Senior citizens must be unable to maintain themselves from their own earnings and property (movable or immovable). 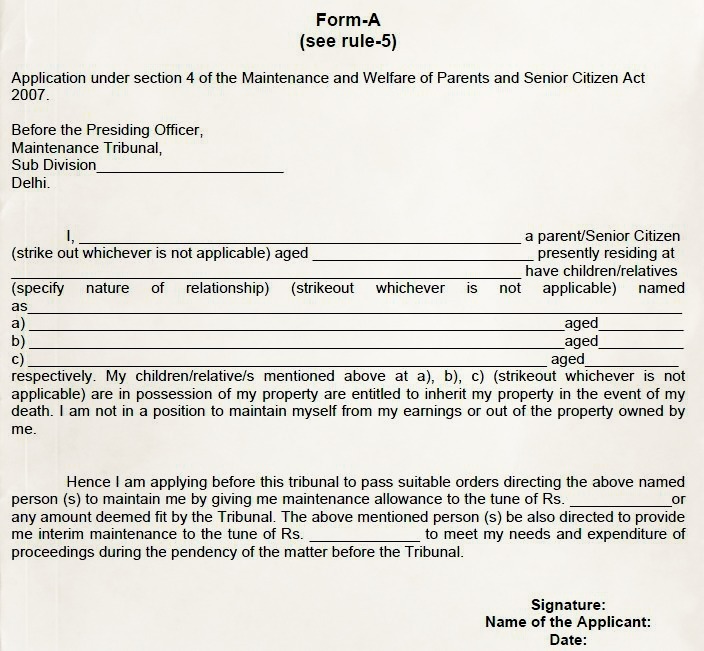 A parent or senior citizen can submit an application for maintenance and welfare to ‘Maintenance Tribunal’ (Senior Citizen Forum) located in the concerned district. Parents or Senior citizens can also authorize a representative (should not be a lawyer) to file the petition on their behalf. 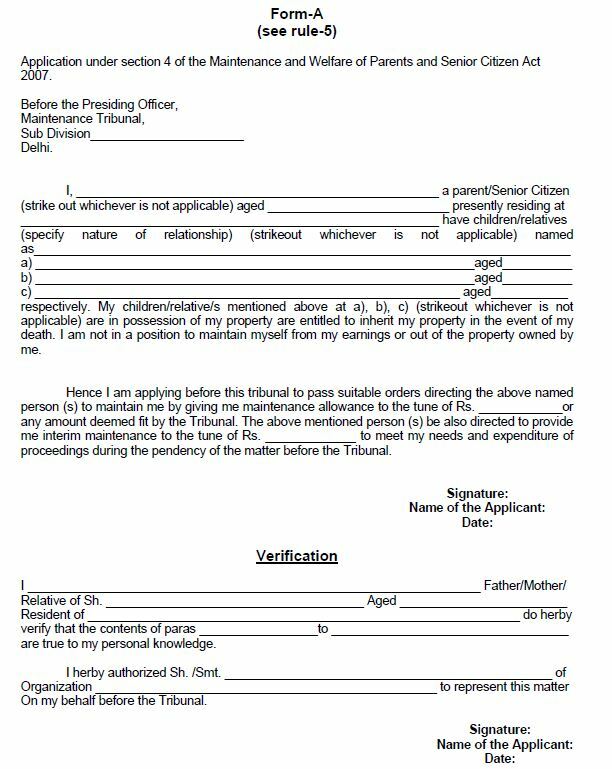 Parents or Senior citizens can submit an application under Section (5) of this Act to get monthly maintenance from their children or grand-children. On receiving the application, the Tribunal will give Acknowledgement (Form B) to the applicant. After scrutinizing the application, Tribunal will send a ‘Show Cause Notice’ (Form C) to the opposite party (with a copy of original Application). If the opposite party appears and accepts his / her liability to maintain the applicant, and the two parties arrive at a mutually agreed settlement, the Tribunal shall pass an Order accordingly. In case, the opposite party does not agree with the Tribunal’s order then the matter will be referred to ‘Conciliation Officer’ (through Form E). The Conciliation officer will hold meetings with the two parties and try to work a settlement acceptable to both the parties, within a period of 30 days from the date of receipt of reference. If both parties agree to the settlement order then the Tribunal shall pass a final order as agreed in such settlement. Value of, and actual and potential income from the property, if any, of the applicant which the opposite party would inherit and/or is in possession of. The above rules and details are related to maintenance that can be claimed by the parents or senior citizens irrespective of whether they have transferred any property or not to their children. Let’s consider a scenario – A parent / Senior citizen transfers a property (by Gift or any other mode, after 2007) to his/her children or anyone with a condition that they have to take care and look after their needs and amenities. And, if such promise is not fulfilled, does not even provide basic amenities to lead a normal life then such Parents / senior citizens can file an application to the Tribunal to consider such Transfer of Property as VOID (as per Section 23 of the Act). The senior citizens can either get back their property (or) can also file an application to claim maintenance amount from the income generated by such Property (which has been transferred). Kindly note that the legal provisions listed under this Act may vary from State to State, as this Act is notified and can be amended (if required, from time to time) by the respective State Governments. For example : The State of Delhi notified & implemented MWPS Act (2007) in 2009. During 2010 & in 2016, some of the rules in the Act were amended. In 2016, an amendment has been notified, as per this, an elderly parents can evict negligent son or daughter from their self-acquired home in 21 days by giving a written complaint to Deputy Commissioner. There is no need to file a law-suit. However, the children will also get a chance to explain their stand which, if found unsatisfactory, can lead to an eviction notice. MWPS Act (2007) extends to the whole of India except the State of Jammu & Kashmir. This Act applies to Citizens of India who reside outside of India too. If there is more than one child or relative, parents can claim maintenance from one or all of them depending on their means of income. Senior citizens should be treated as a human being entitled to all the basic human rights, human dignity and human sympathy. It is, therefore, important that Government and the community play a proactive role in taking care of them. You can get a HOME LOAN to buy a property. You can get a PERSONAL LOAN to meet your short-term financial goals. You can get an EDUCATION LOAN to fund your higher education (or) to fund your Kid’s higher Education. But, you don’t get a loan to fund your RETIREMENT. 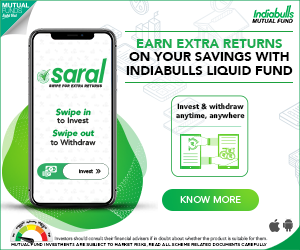 So, if you are an youngster, do save / invest for your retirement as early as possible. Your top most priority should be to save and invest for your retirement. Do not think that it’s too early to start planning for retirement. It is very important that you start early for your retirement, so that you can accumulate adequate Retirement corpus and do not depend on your Children/family financially during the fag end of your life. My granny has transferred her property to her son before 2007. Now her son is not taking care of her. Can she get back her property? If the Transfer has happened after 2007 then she can approach the tribunal and can re-claim the property or apply for welfare maintenance from her child. can a parent who resides in Delhi file a petition before the Maintenance Tribunal under Section 23 of the Maintenance Act, 2007 seeking eviction of her daughter and her family members from a residential property situated in U.P. because of parental abuse committed by the said daughter ? This question is important from the view of territorial jurisdiction which is raised by the District Magistrate at Delhi who presides over the Tribunal. Pl help with the judgment. Though this Act extends to the whole of India (except the State of Jammu & Kashmir), the legal provisions listed under this Act may vary from State to State, as this Act is notified and can be amended (if required, from time to time) by the respective State Governments. So, a parent or senior citizen can submit an application for maintenance and welfare to ‘Maintenance Tribunal’ (Senior Citizen Forum) located in the concerned district only I guess. Hello! I need guidance from you about the same act.My father has filed a case under MWPS against my brother and his wife for eviction from the house.My brother has already left the home on his own wish but his wife still residing at the same place.All hearings and arguments are done. SDM said that you will receive order in maximum 10 days but it has been 15 days my father has not received any letter or order from SDM office. We heard but not sure that there are some amendments happening in the same act so they have reserved the order and waiting for the amendments. We are confused what to do? And can my father go to Deputy commissioner for the same? The respective States can modify and notify the MWPS act.. So, the possibility of new amendments can be your State specific, which I am not sure and do not have information! Yes, you may wait for few more days for the Tribunal to pass their Order, else your father may approach DC / Conciliation Officer regarding this matter. Very good information . Am from small village and am seeing many such cases in my village . Thank you very much for sharing with us about this law . Thank you dear Brahma Reddy! Kindly share the information with your friends and well-wishers! One can get the application form at local District court (Senior citizen forum tribunal). You may kindly take help of a civil lawyer. can I give the complaint in plain writing? Dear Kranti ..I believe that complaint has to be given in the appropriate application form. What is the HIBA (Gift) act per Muslim Personal Law? I believe, it is used to transfer immovable property from parents to children orally and the same is recorded on a stamp paper with two witnesses. It does not require registration with sub-registrar. This act I understand has the blessing of supreme court. I believe that as per Muslim Law, HIBA (Gift) can be oral and written, but getting it (Gift Deed) done on Stamp paper may not be mandatory. If valid rental agreement is done, and if he/she is violating the terms then you can ask them to vacate the property. Extreme step – you may take help of a civil lawyer . I have mentioned about ‘reverse mortgage’ at the end of my article on ‘retirement planning’. You may kindly read my brief article on Reverse mortgage.. Reverse mortgage has not really picked up in India, reason being, strong emotional attachment to the house, and Mortgaging the house is an uncomfortable idea. Is it possible that our EPs which is 8.33% of employer contribution is transferred to EPF fund every month as very low pension scheme from govt. Dear sanjay ..Out of employer’s contribution it is mandatory to allocate 8.33% to EPS fund. Contribution into EPF or EPS is mandatory for those workers whose basic pay plus DA is less than or equal to Rs 15000. Those who earns more than this can opt out of EPF and EPS. However, once a person becomes Employees’ Provident Fund member will remain member till the employment. Thanks for makeing people aware .. will pass on this information to my neighbour this will b very helpful to that couple keep posting Srikanth sir.. ? Dear Tanu .. Kindly do share the article with them…if this is helpful to them, I would be very glad. Thank you! Had absolutely no idea about this, Sreekanth. You are doing a great service. Keep it up. Thank you dear Deepesh. Keep visiting! This act also applies to people who have taken care of the maintenance of children of siblings. Had a case where a childless couple had taken care of the sisters kid right from young age and got him educated by availing loan against their assets. The boy changed his colours on getting a job. The case was decided in favour of the couple and he has been asked to pay maintenance. Another aspect is that Helpage India has been helping Senior Citizens who are facing problems of the above kind. Yes they ask for a donation once the case is settled. Also found that many parents withdraw from the case if the authorities decide to take strict action against the children. 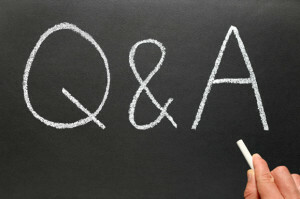 Thank you for sharing your insights on this Topic. I always learn new things from your comment(s). Kindly keep visiting ReLakhs. As per this Act, all State Govts have to ensure that old age homes are established and run in each and every district. Is this happening sir?